Drones looks set to be banned from parks and open spaces in Coventry as part of plans by the city council. Legislation is being drawn up to stop them or unmanned aerial vehicles (UAV) from being flown on council land amid concerns over their use. Flights at Gatwick Airport were cancelled last month after illegal drone activity at the airport. Permission to fly them in Coventry will only be given for some uses and subject to a £50 charge, the council says. The authority has never had a drones policy but says now is the "appropriate" time to do so due to "a growing number of issues with this type of activity". "The concerns are about the nuisance caused by the noise of drones, privacy due to drones carrying surveillance equipment, and the potential danger they could cause to wildlife, animals and people particularly when landing," a council report said. "As a landowner and operator the council is likely to be held liable for any damage caused to people or property as a result of it allowing the flying of drones in its parks and open spaces." Under the policy, any person flying a drone or UAV in the council's parks or open spaces would be asked to stop immediately and leave the site, the BBC's Local Democracy Service reported. Permission to fly the devices will only be granted for certain activities of a professional or commercial nature and people would face an additional charge for any photography undertaken. Cabinet members are recommended to approve the plans on 10 January. 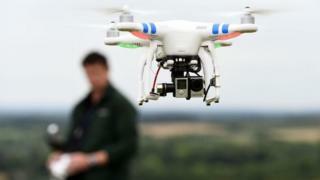 Gatwick Airport: What penalty could a drone operator face?